The DPSST Regional Fire Section is no stranger to remote delivery and over the last ten years has purchased a number of training props that can be moved around the state to assist with the needs of the Oregon Fire Service. The latest addition to the Oregon Fire Training toolbox is the Skid Avoidance for Fire Apparatus Drivers (SAFAD) Program. 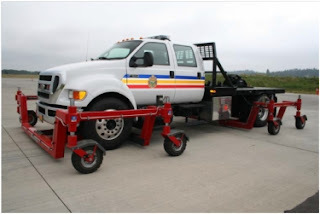 As designed, the program is similar to that used by the law enforcement community with the noticeable difference between the Fire Service and that of law enforcement training being the use of a Ford F-650 crew cab truck with a gross vehicle weight (GVW) rating up to 24,000 pounds instead of the police package sedan. The concept of the program started several years ago and came together towards the end of 2008 and early 2009 as a result of several tragic accidents involving Oregon Fire Service drivers. As with law enforcement emergency vehicle operation course (EVOC), the foundation of the Fire Service Program is a sound base of training that emphasizes the dynamics or performance characteristics of the vehicle, an awareness of the space occupied by the vehicle and how this impacts the overall environment, taking into consideration driving conditions. Once the base knowledge, skills and abilities have been established or identified through such standards as the National Fire Protection Association (NFPA) Driver/Apparatus Operator Competency, the SAFAD curriculum provides the actual hands on experience to support and reinforce the base training. In designing the program the goal was established to provide each attending operator the psychomotor skills and mental attitudes that are essential to becoming the most competent, skillful and responsible driver possible. Overall, the program performance objective is to reduce Oregonâ€™s statistical numbers in the national list of accidents and injuries. In the past 12 years, 16 Oregon firefighters were killed in vehicle crashes while on duty. To deliver the training, various solutions were considered, with DPSST ultimately choosing SKIDCAR Systems. The SKIDCAR System consists of two hydraulic platforms mounted to the front and rear axles of the truck. An instructor who is seated next to the driver adjusts the grip using a computer that is slaved to the hydraulic platforms. The instructor is able to create and repeat circumstances where it is possible for the driver to lose control, experience common roadway hazards, and do so at low speeds with no physical risk to the driver, instructor, or equipment. This entry was posted in Drivers Training, EMS, fire, Fire and EMS, Training Center and tagged Apparatus, Dpsst, Driver Training Program, Drivers, driving, EVOC, Fire Apparatus, Fire Service, Fire Training, firefighter, Firefighting, fireman, Oregon Fire, training. Bookmark the permalink. The blog is fantastic and information which you includes which is regarding to safety equipment is fantastic even i will recommended to all the viewers to follow these instructions and also for more traffic as well. Thanks for this once again.